I’d been using the Diva cup for a little over a year when I found out I was pregnant with Gabriel, and the menstrual cup was relegated to the bathroom closet for over two years (9 months of pregnancy + 17 [wonderful] months of lactational amenorrhea). To be honest, I doubt many GYNs are terribly familiar with menstrual cups, so my doctor saying that it “should be okay” wasn’t all that reassuring, when the IUD being in place and doing its job was all that stood between me and another pregnancy. The Diva Cup comes in two sizes, and, at the time I bought mine, the smaller size was for women who had never given [vaginal] birth. In the months after G’s cesarean birth, this seemed one small positive — I could still use my smaller size menstrual cup — yay! But for some reason, my trusty Diva cup wasn’t working. I remembered there had been a bit of a learning curve when I first started using it, so I double checked that I was doing everything correctly. In the process of hunting around the Diva cup website, I came across their updated sizing recommendation, that ALL women over age 30, regardless of having ever given birth (and all women, regardless of age, who have given birth vaginally OR by Cesarean), should use the larger size cup (Model 2). Humph, so much for getting more use out of my original cup! I shelled out the thirty-five dollars for a new, “Model 2” Diva Cup, only to be met by more failure. 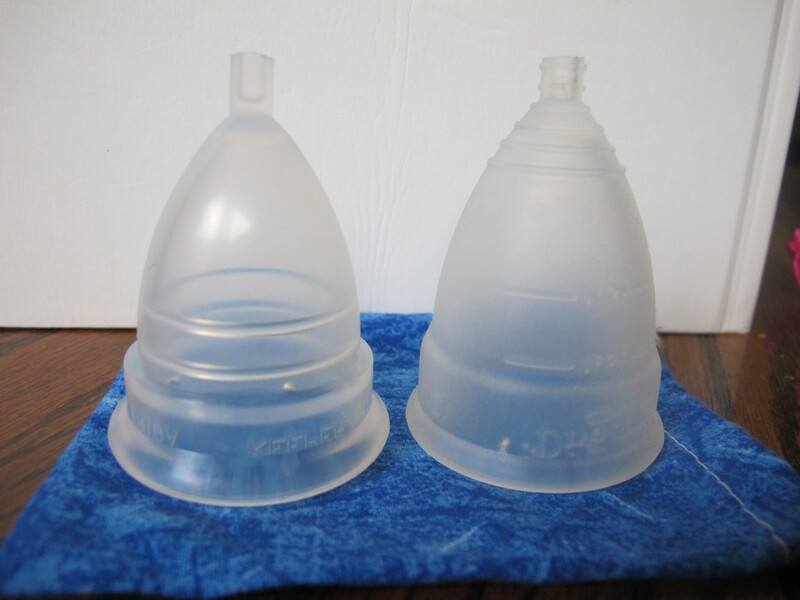 I couldn’t get either size Diva Cup to fit correctly and comfortably and not leak, and I was almost ready to throw in the cup! Then I came across Glad Rags, and their 90-day, money-back guarantee on the Moon Cup, another silicone menstrual cup. After consulting with a customer service rep, I chose the larger size Moon Cup (size A), placed my order, and hoped for the best! After several months of use, I’m pretty happy with my Moon Cup. It is very similar to the Diva Cup, but, for whatever reason, it works for me, while the Diva Cups don’t (even though the smaller Diva had worked for me, for over a year). Both are medical grade silicone, but the Moon Cup seems to be slightly more flexible (and perhaps thinner?) than the Diva. My only complaint: The Moon Cup does not work when I am lying down. This means that I still have to use a tampon sometimes, usually overnight on my heaviest nights, which averages out to about three nights a month — not perfect, but not bad! I’ve also realized that, thanks to the comfort level with my body that developed while using a menstrual cup, I can use tampons without applicators, which really cuts down on the waste when I do need to go that route. This entry was posted in Green Ideas, Health and tagged Diva cup, MoonCup, reduce. Bookmark the permalink. 5 Responses to Third cup’s a charm? Well, that sounds frustrating. I, too, am on my third cup, but only because I’ve sent two of them up in flames! But they are just SOOOO much easier and more comfortable than any other solution that I think I’d keep mine even if it weren’t the environmentally friendly choice. I sorta doubt this will help, but I went through a period (no pun intended) a while back when I was having a bunch of leaks. It turned out that I wasn’t actually getting the thing to open properly once inserted. I think sometimes the little holes get blocked as it’s opening and that somehow keeps it from opening all the way. So I’ve now learned how to feel when it pops open, and if I have any doubt I take it out, clean out the little holes really good and re-insert it. The other thing that has helped is to run it under cold water just before inserting it. It makes the silicone stiffer (until it warms up again) which seems to help it to pop open. As I said, I sorta doubt that will help, but figured I’d mention it just in case. You burned two cups! I think I only knew about one! I think your observation/tip is spot-on — leaking is usually not due to “overflowing,” but to the cup not being inserted quite right, which, as you say, usually means not fully opened. I’ve been on the fence about getting a reusable cup for a while now. In the mean time I’ve been using the disposable Soft Cup version which is loads better than dealing with tampons or pads. Well, Glad Rags does have the 90-day money-back guarantee with the Moon Cup, so that’s not a bad place to start! Good tip! I was thinking about going with then after reading your blog anyway!